Camella, the flagship brand of Vista Land & Lifescapes Inc., is simultaneously launching five projects in a continuing bid to expand its Mega Manila portfolio and further strengthen its position as the country’s most preferred housing brand. Vista Land Chairman Manuel “Manny” Villar, Jr. and other top company officials led the launching of the projects at the Philippine International Convention Center (PICC) in Pasay last April 10, 2015. The new projects are: Camella Carson in Vista City at Daang Hari, Camella Alta Silang in Cavite, Camella Sierra Metro East in Antipolo, Camella Belize at The Islands in Dasmariñas (Cavite) and Camella Verra Metro North in Valenzuela City. These five projects have an aggregate market value of P5.6 billion. Mr. Ric Pallesco, Camella Division Head, said the new projects “will continue to shape the Metro landscape” with master-planned Camella communities, known for distinctive designs that take into consideration all the essential elements of a comfortable living. Camella masterplanned communities are designed to be self-contained, with lifestyle facilities that deck all other Camella properties like clubhouses or function halls, swimming pools, play courts, playgrounds, parks, walkways, and jogging or biking paths. Vista Land President and CEO Manuel Paolo Villar said that given the bright outlook for the housing sector, Vista Land “will continue to be a dominant force” in the market. “We are by far the leader in the house-and-lot segment and have a strong competitive advantage given our track record of delivering quality homes for more than 35 years across the country,” he said. 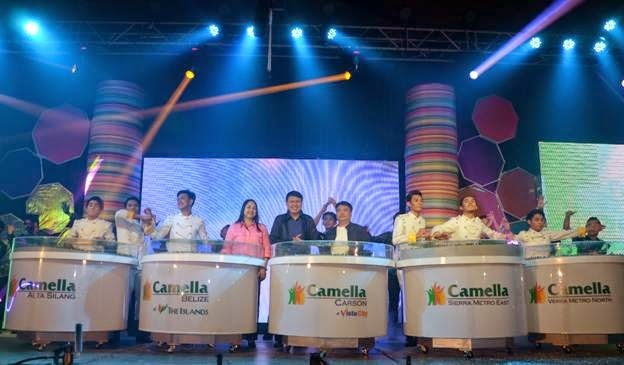 Camella has been recognized in an industry study as the most preferred housing brand in the Philippines bringing Vista Land’s presence in 34 provinces and 76 cities and municipalities around the country and making it the real estate company with the widest geographical reach in the housing business. Camella is the subsidiary catering to the mid-market segment of Vista Land – the country’s premier home builder in close to 38 years, it has built an immense selection of affordable, high-quality homes with world-class settings and exquisitely themed communities across our islands – each one carrying Vista Land’s expertise in space planning, carefully thought out and sustainable architecture, and an innate knack for selecting the most accessible and attractive locations. To date, the group has built close to 300,000 homes and maintains a powerful presence in Mega Manila. For more information about Camella developments, call the Camella hotline at 02-Camella or 226-3552; and our mobile at 0999-886-4341. Keep up with the latest Camella information, news, events and announcements through www.camella.com.ph. Like "Camella Official" on Facebook and follow "@CamellaOfficial" on Twitter.